GameSpy online server browser deactivated on December 31, 2010 due to Electronic Arts losing the Lord of the Rings license. This game is no longer available digitally. 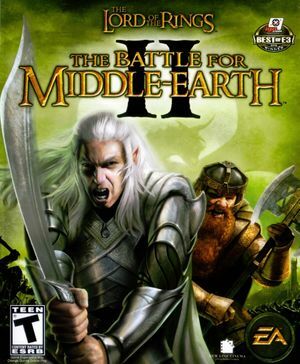 It was taken down from digital stores, as Electronic Arts lost the Lord of the Rings license at the end of 2010. Delete or rename CS01.vp6, EALogo.vp6, TE_LOGO.vp6, NLC_LOGO.vp6 and NewLineLogo.vp6. Use Battle For Middle Earth 2 Camera Fix. Frame rate is capped at 30 FPS; removing cap increases game speed. When first starting the game after the installation the game instantly crashes with an error. Make sure to change the Resolution value to your preferred resolution.